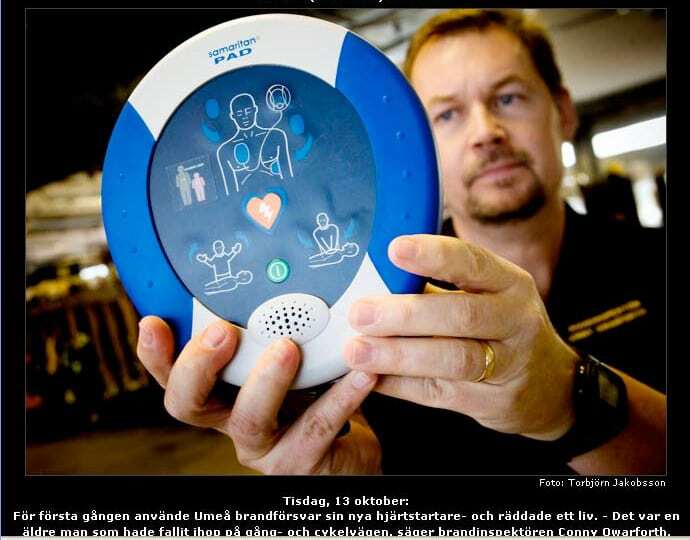 On October 13, staff from the Umeå, Sweden fire department were able to save the life of a person who had suffered from a cardiac arrest, using a recently-purchased automatic external defibrillator. The department had purchased five HeartSine® samaritan® PAD defibrillators from ViaMedici in June of this year to properly equip its emergency vehicles. Last week, they got a chance to put one to good use when an elderly man collapsed in central Umeå. A world leader in personal and public access cardiac rhythm management, HeartSine’s mission is to advance the deployment of lifesaving defibrillation therapy in non-traditional areas of care through the development of proprietary technologies and quality products. Its HeartSine samaritan PAD is a sophisticated, lightweight automatic external defibrillator designed for rescuers of all skill levels and is ideal for sports facilities, schools, churches and business.